With the latest 4.2 update, you can now import/export data into/from the "Send Photo Later" queue. This is great for backing up the queue, or if you need to re-upload photos. 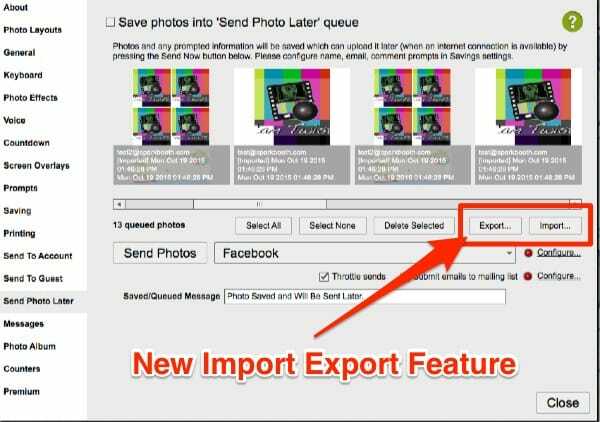 To access this new feature, go to Settings and select "Send Photo Later", and note the new import and export buttons. The import feature will import any of the tab-delimited files generated by Sparkbooth. If you have the prompts enabled, you can import the sparkbooth-prompts.txt. If you have uploads enabled, you can import the sparkbooth-uploads.txt file. If you want to import the prompts or upload log from another computer, copy the photos folder over and set it as the layout folder under Settings > Saving before importing the log file. New Facebook "Post to Account Page then Share" guest upload option. 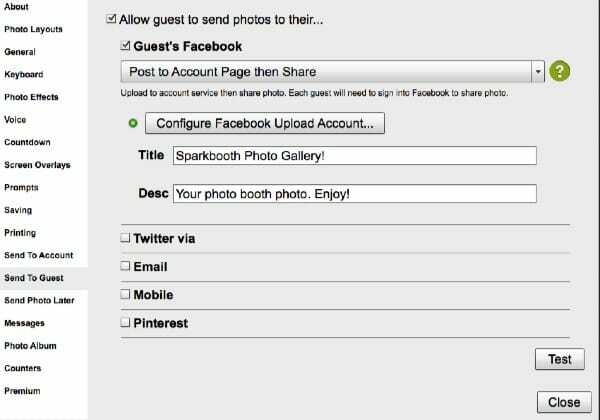 Posts the photo to the configured Facebook account or page, then your guests can share the post from their Facebook account. Using this option does not require Facebook app review for custom Facebook apps. Use new Facebook like dialog for pages. Facebook has retired the previous like dialog. [DSLR] Add Live View bulb mode setting for dark preview using external flash. 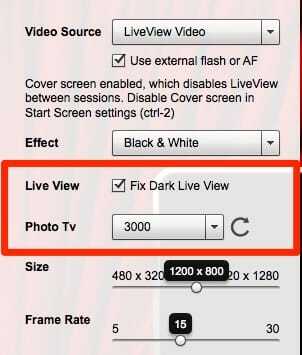 This option requires enabling "Use external flash or AF", and camera set to M or Tv mode. New beta update 4.2.27 enables guest green screen selection. You can change backgrounds by enabling the keyboard shortcut, on-screen button, or selection screen. See release notes. 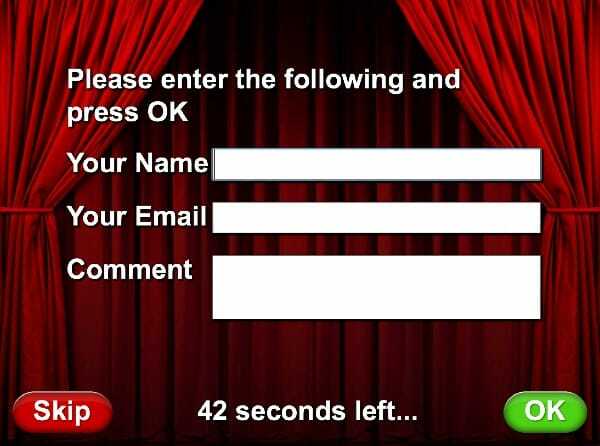 New beta update 4.2.10 enables user surveys in photo kiosk mode so you can collect names, emails, telephone, or comments before printing or uploading photos. 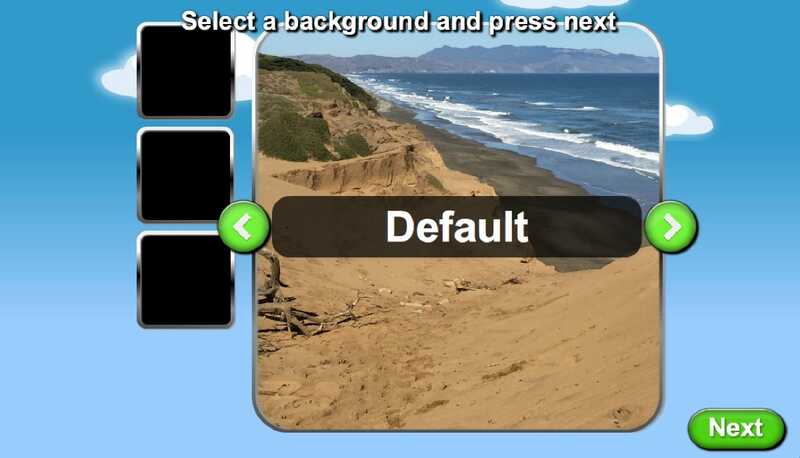 You can enable this new feature under Photo Kiosk Settings, then select Prompts. See release notes. You can download the beta below. Note: this beta also include the new green screen feature, photo kiosk counters, and photo kiosk mailing lists. New beta update 4.2.6 enables email subscriptions with MailChimp in photo kiosk mode. You can enable MailChimp subscriptions under the Email settings, or from the Send Photo Later queue. See release notes. You can download the beta below. 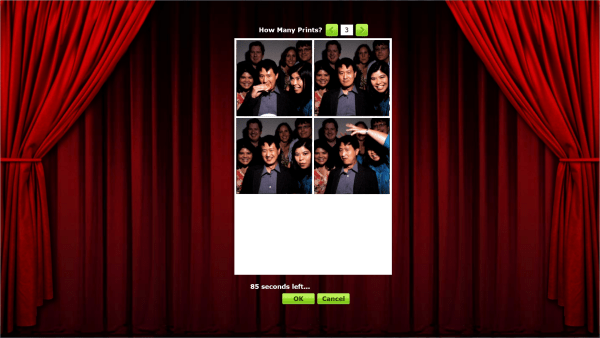 Note: this beta also include the new green screen feature and photo kiosk counters. New beta update 4.2.6 enables counters in photo kiosk mode. You can use counters to track uploads and prints, and actions like notifications, disabling printing, or closing the kiosk when counter limits are reached. Counters can be viewed under Settings > Counters, or by pressing ctrl-4 from the main screen. To learn more about counters watch our short tutorial. See release notes. You can download the beta below. Note: this beta also include the new green screen feature. Open Sparkbooth Settings by pressing F1 or the settings button in the upper right. Enable Printing. Also enable the print prompt by checking the option to "Prompt user to print" and "With preview"
Select User Controls from the list to show the print copies control. Select "Enable Print Copies Selection"
Oct 12, 2011: Updated to 3.0.6 to fix a couple bugs. Added Postmarkapp.com to email photos to users. Select this option in Uploaders settings. New on-screen color button so your users can change video filters. New on-screen start button as an alternative to the "Click to start" option. Enable Facebook page albums selection. Fixed missing "z" key from on-screen keyboard. Fixed Posterous and SmugMug uploader issues. This preview does not include the Canon camera or the native webcam features. These are still under development, but feel free to email me if you want to try it. If you want to use your Canon camera, please read the instructions carefully to get access. You can use your Sparkbooth license to activate this preview. If you have a Sparkbooth Party Edition license, I will be offering an upgrade to Sparkbooth which will allow you to get Sparkbooth 3. Details coming soon, or please email me if you can't wait. Convert Twitter service uploaders to new OAuth authentication. On August 31th, Twitter will be turning off basic authentication which is used by all the Twitter upload services in Sparkbooth 2.2. So these upload services will stop working on that date. 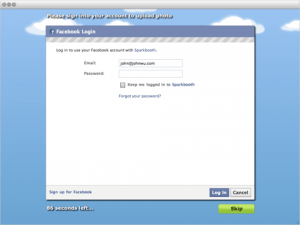 Please use Sparkbooth 2.3 if you wish to continue using Twitter for uploads. New application lock feature. When locked, users cannot quit the application, exit full screen, access settings or camera dialogs. Press control+L or command+L to toggle lock mode. Unlocking can be protected with a password.